G.G. 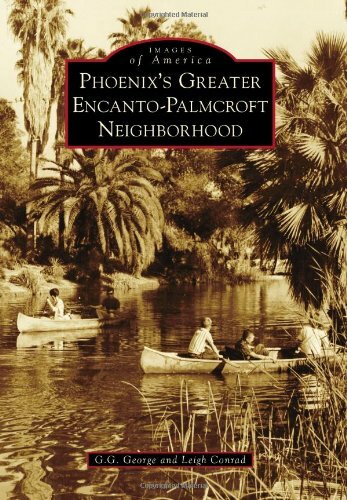 George and Leigh Conrad, authors of Phoenix’s Greater Encanto-Palmcroft Neighborhood (Arcadia Publishing), will be at the Heard Museum to sign copies purchased at Books & More during our annual celebration, Holidays at the Heard. The book features museum founders Dwight and Maie Bartlett Heard, the founding of the Heard Museum and the neighborhood in which it is located. Copies in paperback are available at $21.99 each. Leigh Conrad will appear noon to 2:30 p.m. Friday, Dec. 26. G.G. George will appear noon to 2:30 p.m. Saturday, Dec. 27. This is the title of a book by G.G. George and Leigh Conrad and published by Arcadia Publishing. Book signing Dec. 26-27, 2014, at Books & More.